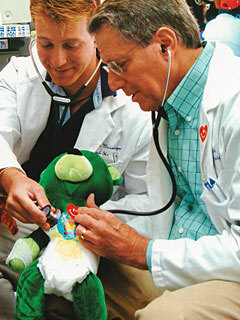 We are an internal medicine practice with special emphasis in preventive medicine and cardiology. Our practice is scientifically based, but we are truly dedicated to providing highly personalized care. We emphasize lifestyle optimization including nutrition, fitness and life-balance. Dr. Stark is a Harvard-trained physician with advanced training and extensive research experience in cardiology and lipid (cholesterol) metabolism. His interests include early detection and prevention. Dr. Stark teaches on the Clinical Faculty at New York Medical College, and serves as Medical Director of the Cardiovascular Prevention Program at Greenwich Hospital / Yale New Haven Health. Our nurse, Joanne Verderosa, and office manager, Monica Levine, welcome your telephone inquiries so that we can answer any further questions about our practice. Internist and cardiologist in Greenwich, Connecticut. Serving patients in Westchester County, NY and Fairfield County, CT.
Focus on primary care, "family doctor for adults", as well as cardiology care, "heart doctor", for individuals with cardiac concerns. Personalized attention is key to excellent care.